Would you buy music from Groupon? 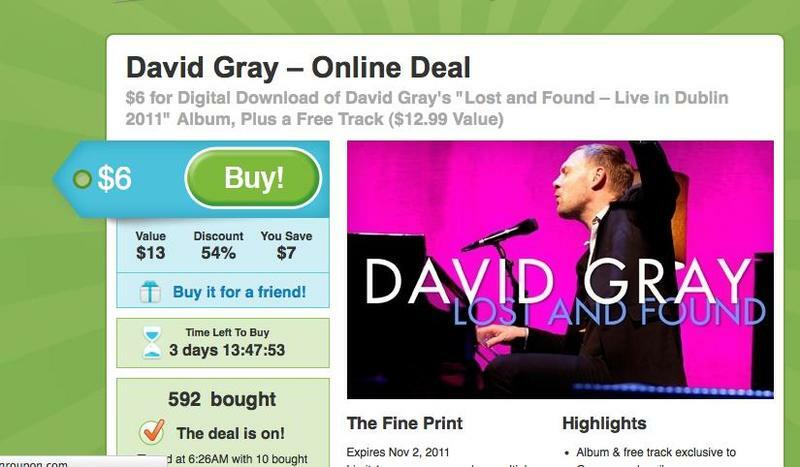 The group coupon site is now offering British musical artist David Gray’s newest album “Lost and Found-Live in Dublin,” and believe it or not is actually debuting the album. Groupon offered Rihanna’s album “LOUD” late last year for $5; however, this marks the first time that Groupon will actually exclusively debut an album. Groupon has a huge audience. While debuting your album on the service may seem silly at first, it also may get more eyes on the release, and ultimately lead to more money in a musicians pocket. What do you think about artists releasing albums through Groupon? Would you buy one?